As we know already, in France, his musical talent opened the best possible doors. Joseph Bologne was Marie-Antoinette’s music teacher and became the maestro of the Concert des Amateurs,[ii] “a title of extreme respect given to a master musician” (Wikipedia). He was then appointed director of the Concert de la Loge Olympique, the largest orchestra of his time (65-70 musicians). It is in his capacity as director of the Concert de la Loge Olympique, that he directed the world première of Haydn’s six “Paris Symphonies” which had been commissioned by the Concert de la Loge Olympique. 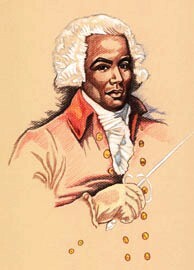 So, as a denizen of Versailles, Joseph Bologne met Haydn and he also met the white Mozart. He is one individual whose talent helped override ethnicity, but not altogether. When Saint-George was appointed director of the Royal Opera of Louis XVI, three divas opposed Saint-George‘s appointment because he was a mulatto. Being a mulatto had already been a threat in Joseph’s life. Before Joseph’s father emigrated to France, he had to flee Guadeloupe where he was suspected of murder. He sought refuge in France to prevent Nanon and Joseph from being sold as slaves. Moreover, on 5 April 1762, King Louis XV decreed that people of color, nègres and mulattos, had to register with the clerk of the Admiralty. Both Nanon and Joseph were registered. Nanon was registered as being 34 years old. As for Joseph, he was mistakenly registered as Joseph Boulogne by La Boëssière, his master of arms. It could be that, by then, Georges, Joseph’s father, had returned to Guadeloupe. After the Seven Years’ War, France had chosen to keep Guadeloupe rather than New France. His career as a musician may have suffered because of the divas’s refusal to be seen next to a mulatto, but Joseph has other talents. La Boëssière had a fine student. Joseph became one of the finest swordsmen in Europe, if not the finest, as well as an extraordinary equestrian. His talents and reputation as an athlete served him well when divas rejected him. He excelled as an athlete and it brought him recognition. But Joseph de Bolo(u)gne is remembered not as an athlete but as a prolific composer of the classical era (Haydn, Mozart and early Beethoven). His compositions are listed in his Wikipedia entry. Joseph served in the army of the Revolution against France’s foreign enemies, but he is not known to have participated in the misfortune of his student, Marie-Antoinette, and her husband. On the contrary, his father having been ennobled in 1757, Joseph was an aristocrat at a time in history when aristocrats were almost systematically executed. Technically speaking, Joseph de Bologne, Chevalier de Saint-George survived the French Revolution, but barely. In 1793, he was accused of using “public funds for personal gain.” (Wikipedia). He was acquitted, but in the meantime he had spent 18 months in jail and upon his release, he no longer had patrons. Most had been guillotined. Joseph did direct orchestras on a few occasions, but too few. He died a poor man, in 1799 at the age of 54. 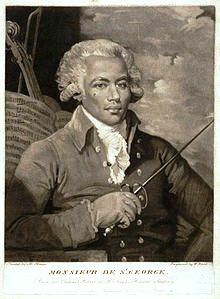 I have not paid much attention to Joseph Bologne, Chevalier de Saint-George’s role in the military. Moreover I do not know why Napoléon ordered that the Chevalier’s works be destroyed. I need to read the books that are now being published on Joseph Bologne. These and CDs of his music are available from Amazon.com. Moreover, there are biographical videos on YouTube. I will insert them in a separate post. In the history of music, Joseph de Bologne is considered an important figure not only because of the music he composed, but also because he was one of the earliest black musicians to compose what we call “classical music.” In fact, he composed during the “classical era” (1730-1820). But his story is nevertheless rather sad. His rise to success was extremely rapid, but he was a mulatto, the ‘black Mozart.’ Moreover, he was jailed for a crime he had not committed. 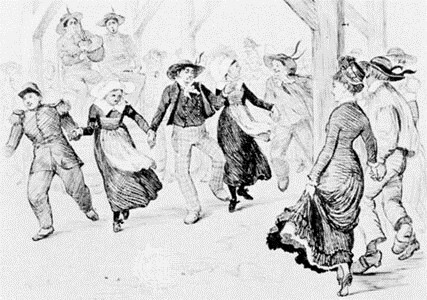 [i] Many folk dances found their way into suites and variations, but some were also solo pieces. For instance, although a polonaise may be found in a suite, Chopin used it as a solo piece. The same is true of his mazurkas, not to mention the gavotte and the folía, folies d’Espagne, found in Baroque music (1600–1760). What seems particularly important here is the link between dance and music. [ii] In eighteenth-century France, an “amateur de musique” was a lover of music. Haydn, Mozart and Beethoven were “amateurs de musique.” French is changing. The word may now be used to differentiate professional musicians from musicians who are not professionals.